Spare, naturalistic drama about a woman who makes it out of Auschwitz. The setting is Berlin. The time 1945, post World War II. Nelly is a German Jew and a Holocaust survivor. Injured and left for dead by the Nazis. Her face now wrapped in gauze as a result of a gunshot wound to the face. A disfigurement occurring even before the picture has even started. She is accompanied by her good friend Lene (Nina Kunzendorf) who drives her back into Germany through an American checkpoint. Nelly wants to locate her husband Johannes (Ronald Zehrfeld) nicknamed ‘Johnny’, who happens to be a non-Jew. Lene would rather have both of them just leave the country without him, move to Palestine and help establish a Jewish state. However, Nelly is troubled by the past, not the future. To reunite with her erstwhile spouse is her main objective. Phoenix concerns people picking up the pieces of their lives after the war. German director Christian Petzold has worked in this realm with Nina Hoss previously. This is his 6th movie with her as his muse. In the story, her physical and emotional identity has been obliterated. Her surgeon wishes to “re-create” her, to give her a new face and hence a new identity. Despite his recommendation, she wants to looks exactly as she did. The drastic reconstructive surgery is an unbelievable success. Save for a few minor facial scars, Nina is remarkably beautiful. She looks like herself, but then again she doesn’t. She appears different enough that her own husband doesn’t recognize her. Yet there are still enough similarities to her previous physical appearance to suggest a resemblence. The whole conceit strains credibility, so don’t think about it too hard. There’s a lot of ambiguity here. Pale and thin, she has returned like a ghost in search of her past. She visits the bombed out rubble of her bygone home like a specter floating over the ruins. Nina was a singer before the war. Her husband, a pianist. As a Holocaust survivor, Nelly has risen from the ashes of the past. Phoenix symbolically describes her progress, but it’s also the name of the club at which she finds her husband working. Kurt Weill’s melody, “Speak Low” is a recurring score that pops up here and there. The tone of the drama is pensive and atmospherically haunting, but it’s very vague. The way these two souls interact is a long drawn out game of deception and remembrance. You’ll have lots of questions as the narrative unfolds. What exactly are these people thinking? Their tentative relationship is based on cryptic intentions. Director Christian Petzold keeps all of these questions unanswered on purpose as Nina goes in search of her former self and for truth. Just simmer for awhile in the pensive mood. The mystery ultimately builds to a perfectly constructed moment of clarity. This entry was posted on September 2, 2015 at 9:36 am and is filed under Drama, Mystery with tags 2015. You can follow any responses to this entry through the RSS 2.0 feed. You can leave a response, or trackback from your own site. Seems like a film worth seeing. An enigma wrapped inside of a conundrum. Thanks for the well written review which is beautifully atmospheric. The less you know the better. Some reviews have gone into more detail but I think it’s that sense of discovery that compels the viewer to watch. It sounds very interesting to me. I’m read some good things about this film and I definitely want to see it. Thanks so much, Mark. The script leaves what’s going on in the actors’ heads as a bit of a mystery, so you keep watching to find out what exactly is going on. I give this 3 stars. I had a few complaints about this. After minor facial surgery, her husband couldn’t recognize her? Come on. How often did he look into her eyes? 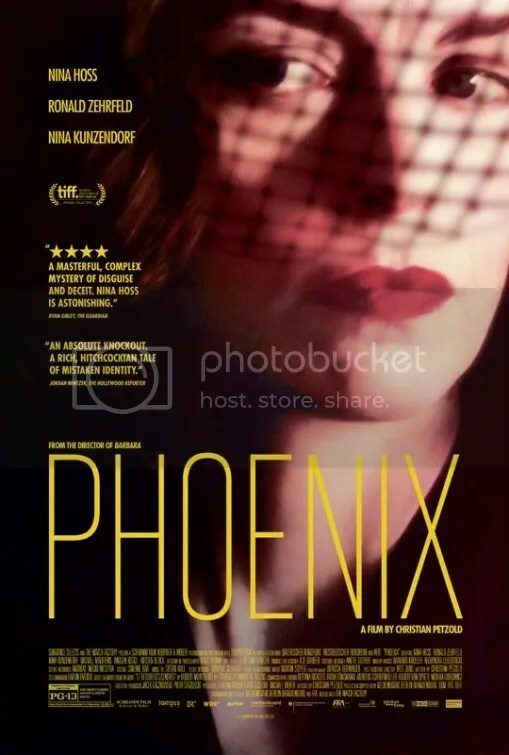 One of my friends recommended Phoenix to me and I understand why based on your description of its mood as pensive. That’s exactly his kind of movie. It seems like even though it’s ambiguous that Phoenix comes to a strong conclusion though, so I’ll be sure to check it out. It’s still in theaters but not for long.